The vacant CQ3 site from Queen’s Quay. Planning permission was given on 5 February 2019. No official announcement (at the time of submission) about an expected date for the start of building work. A large-scale redevelopment of an area of disused harbour land (including the former Donegall Quay ferry terminal), on the seaward side of the cross-harbour bridges. It includes three office buildings, a hotel and a multi-storey car park. 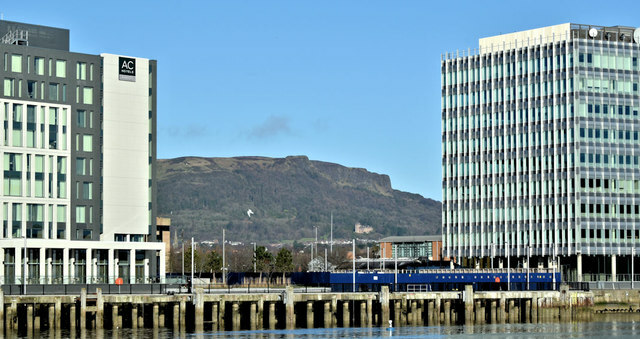 The third office building (CQ3) received planning permission on 5 February 2019 “City Quays 3 - erection of 16 storey office accommodation (74 metres maximum height) comprising 23,976 sq metres of gross floorspace, associated access, public realm and other ancillary development. Lands approximately 100m north of M3 Cross Harbour Bridge and bounded by the River Lagan to the east Donegall Quay and Clarendon Dock to the north Corporation Square and Clarendon Quay to the west”.